Hands up all make-up addicts? I’m guessing that if you’re reading this, that’s likely to be you. Its certainly me. When I saw this make-up brush set from Sonia Kashuk, I got all the symptoms. Racing heart beat. Sweaty palms. Thinking about the object of my desires day and night. Did I need this set? No. I own more makeup brushes than I can possibly need. Did I want it? Oh god, yes. Yes. Yes. Yes. There were lots of reasons NOT to buy this – first of all, its only available in the US, and tracking it down was a nightmare. I’d also just purchased the ‘Nic’s Picks’ set of Real Techniques face brushes, which are gorgeous. So there was no way of justifying this other than stupid, blind love. But would you look at how gorgeous these are? Sigh of pleasure. How could I resist? 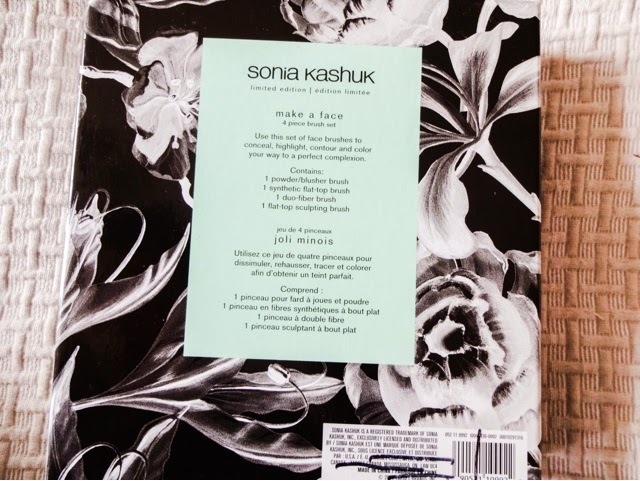 Sonia Kashuk is one of those fabled brands that’s both good value and incredible quality. 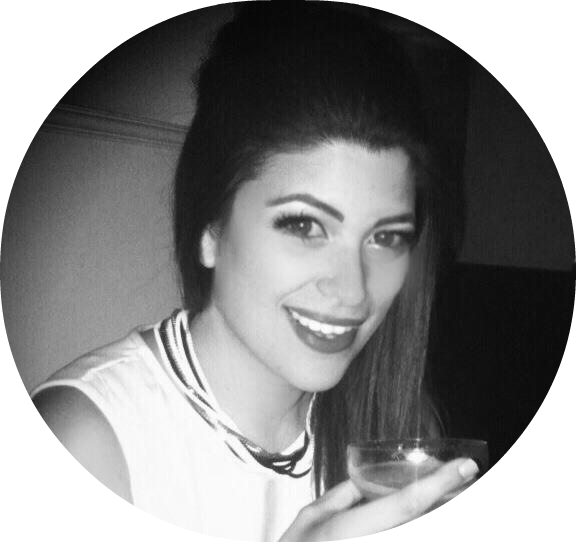 You will hear bloggers raving about their stuff, but its hard to get hold of in Blighty. 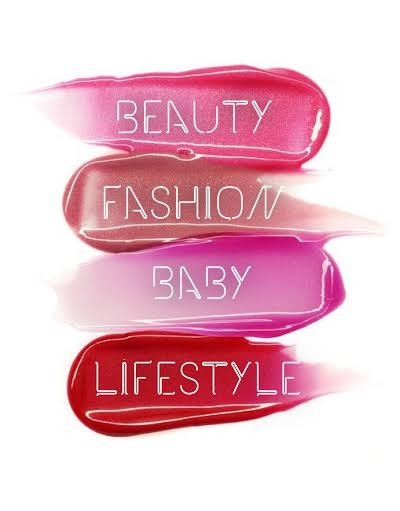 Cult Beauty used to stock the brand, but no longer does. Space NK is the only place you can get it, and it has a stupid premium on it that makes everything way more expensive than over in the States. This set was only available at Target anyway, and they don’t ship to the UK. But nothing is impossible to the make-up addict desperate for her fix, and I managed to find an eBay seller with some in New York who would ship them over here. Now, for our American cousins, these were only 24.99 (about £15.50), which is an insane price for brushes of this quality and beauty. 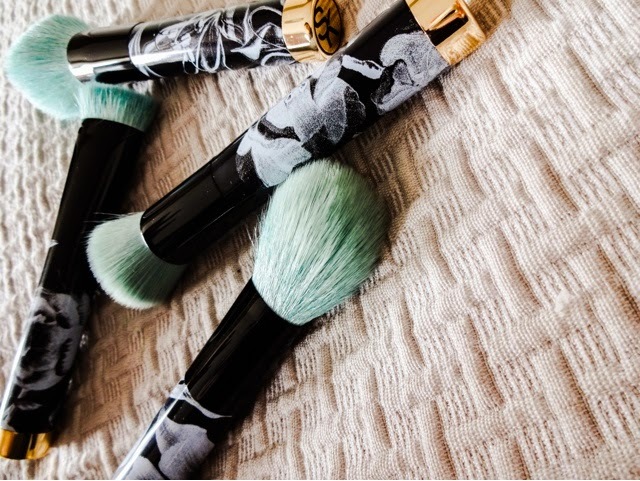 You could purchase similar individual brushes from Sonia Kashuk that would cost about 54 dollars (£35), so the set is great value. But to get my eager British mitts on them, I had to pay 35 dollars plus 10 dollars on shipping – a total of about £32. So double the US price to get them, but on the whole I think the set is worth what I paid as the quality is exceptional – I’ve read its even better than the usual good standard from this brand. 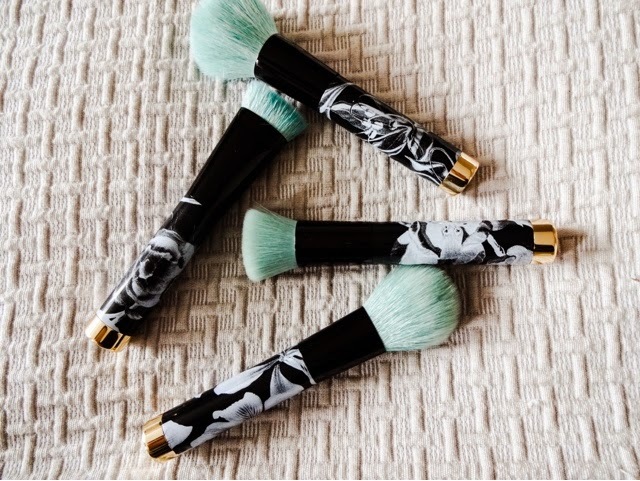 Beyond the fact that these are insanely gorgeous with their turquoise plumage and floral print, gold tipped handles, I also really wanted to get my hands on the flat topped sculpting brush. 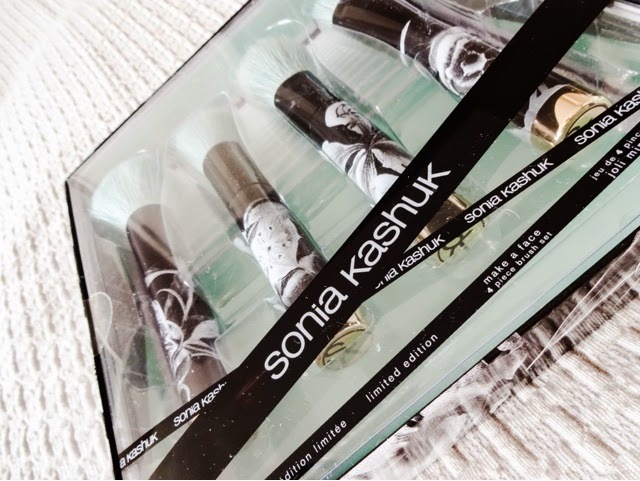 Despite its popularity, Sonia Kashuk had discontinued this brush. The closest matches we can get are the Real Techniques Rose Gold 301 Contour Brush (which is stunning, but almost the same price as this whole set at £22) and the fabled NARS Ita brush, which is not only perpetually sold out but also costs a whopping £43 – this set starts to look better value despite the premium in getting hold of them! 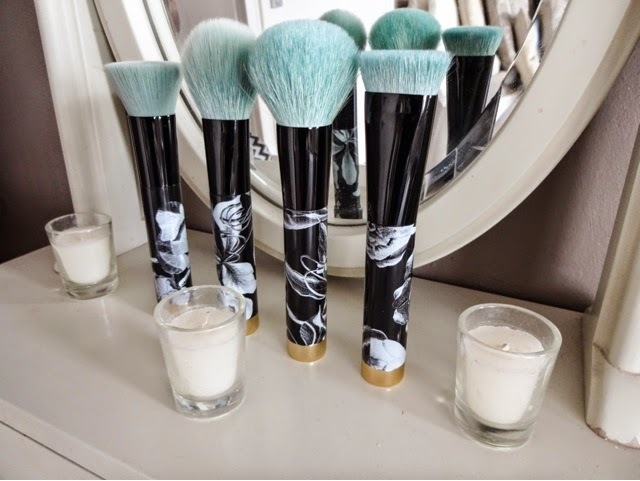 A massive plus is that these brushes are not just insanely beautiful, and good value despite the extra cost of getting hold of them over here, but they are truly functional. These aren’t the cheapie brushes you might expect from a ‘drugstore’ set. Dense Powder Brush- Powder brushes are usually the least useful brush for me in a set. 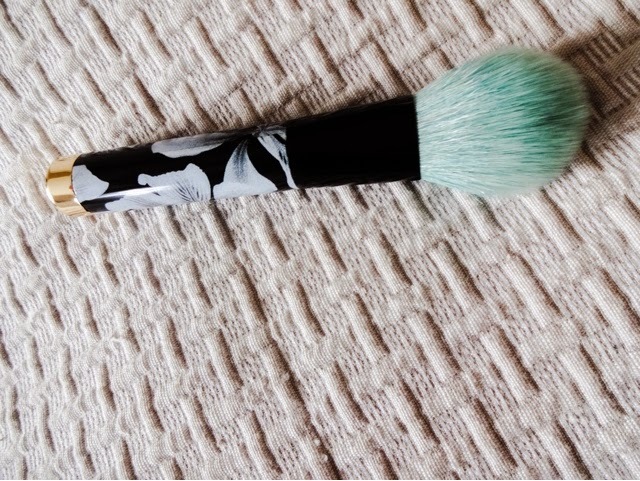 I generally don’t wear powder blushes as they look un-natural on me, and most traditional powder brushes are not dense enough to for me to use to apply the mineral powder foundation I normally wear – only this one totally is! The size, weight and density is very close to the Bare Minerals Full Flawless Face Brush, so its ideal for getting a denser finish where most powder brushes are too fluffy and loose. 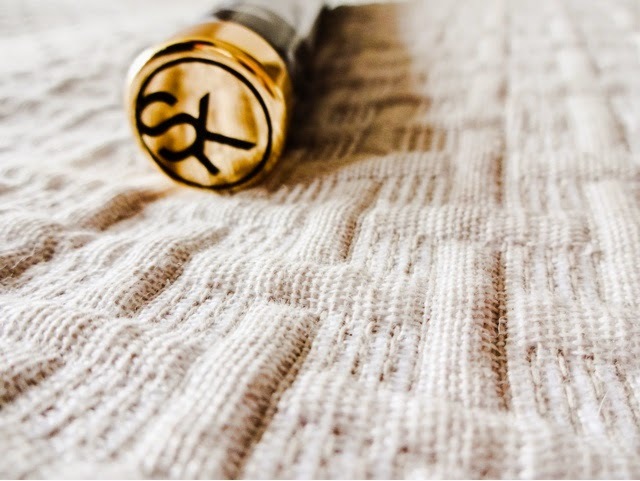 Its extremely soft but packed with enough bristles that product doesn’t just evaporate. 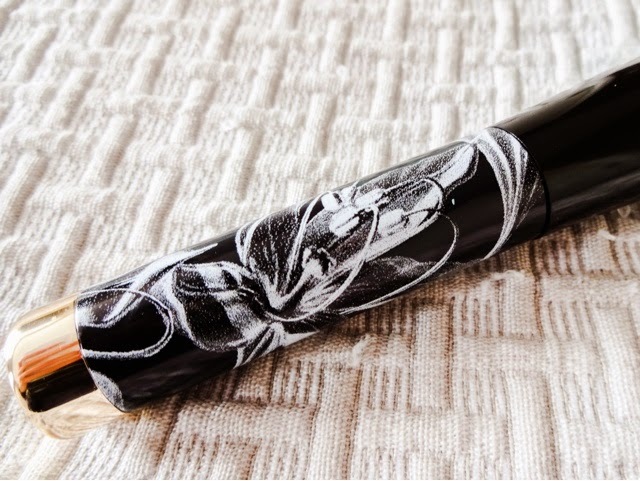 Flat Top Kabuki Brush – Apart from the contour brush, this was what really sold this to me. 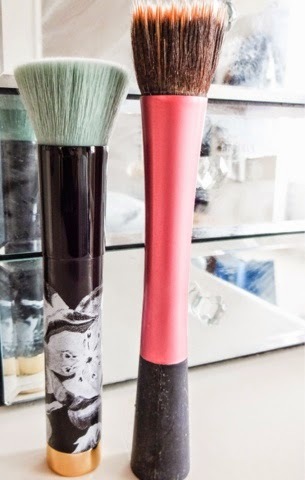 Most days, I layer a BB cream under my mineral powder foundation, and I use a flat topped brush – the Real Techniques Buffing Brush –to get a light, even finish with it on my skin. That makes it even greater that the powder brush in this set can handle my dry base, while I can keep this one for creams and liquids. This allows a quick application without any tell tale streaks and marks, so it works really well for that purpose. It’s stiff enough to blend product seamlessy, but doesn’t feel scratchy at all. I also like that the head is fairly compact as it makes it much easier to work with and get into all the crevices of the face. A worthy successor to my Buffing Brush. 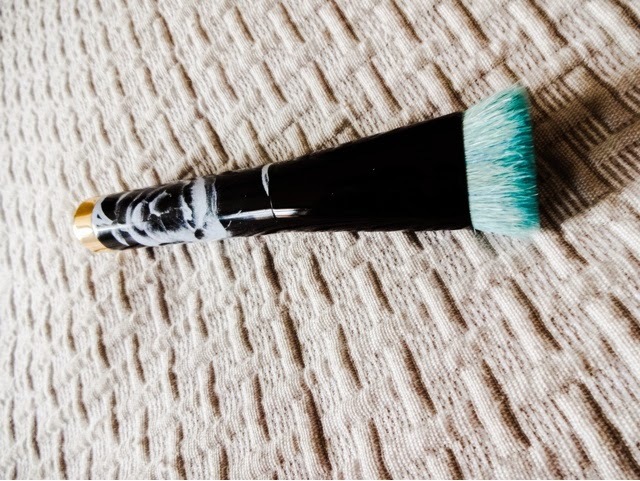 Duo Fibre Multipurpose Brush – Quite a unique little brush here. Its fluffy enough to diffuse blush well and yet tapered enough to use for precise placement of highlighter or bronzer. You could even use it quite happily to contour, although I prefer the next brush for that. The really nice thing about this is that the ferrule is pinched, so it has a round side and flat side. The brush also tapers to a point, which makes it an unique shape and useful for a variety of things. Its also great for general blending work. 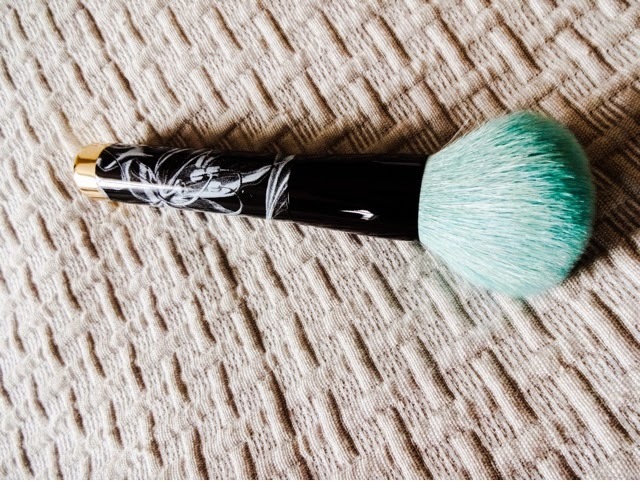 The fact that its so unique and versatile makes it very worth having and I like that its different from any other brush in my collection. Flat Top Sculpting Brush – The absolute star of the show has to be this baby. As a contouring addict, I’m quite picky about brushes for that job. I had been using the MAC 168 which works very well, but I was keen to try a flatter brush to get a more precise placement of pigment on the face. This beauty is what I’ve been waiting for. The bristles are massively dense and short, which gives you a very dark shadow. In fact, you have to be careful not to overload the brush with pigment and take a light hand. You might also need to sheer the result out a little with the brush above. 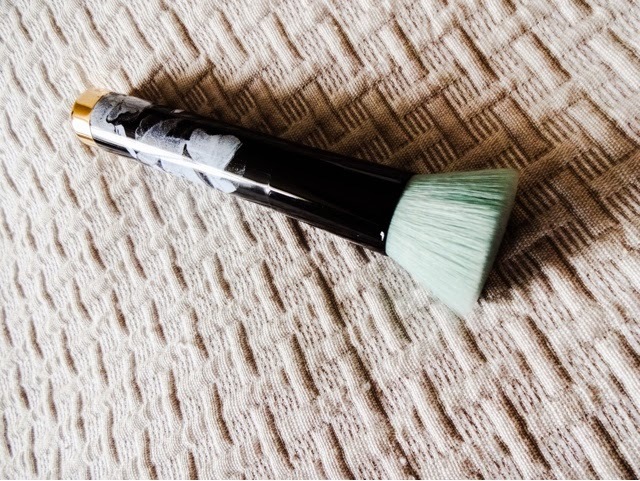 But if you like a defined, sharp cheekbone, a chiselled jawline and a slimmed down nose, this could well be the brush to help you achieve that! I I use this with Makeup Revolution Mono Shadow in ‘Mocha Love’ (its an eyeshadow but the generous pan size and perfect pinkish-beige colour make for the ideal contouring colour). So, to sum up…there’s really not much bad to say about this set. If you have the chance to get your paws on it, do. You will not be disappointed. Want a full set with eye brushes as well!